There once a youkai, who was a ghost was afraid of getting dosed. She went into a tunnel right under a channel and wouldn't come out again. The ghost's name was Yuyuko Saigyouji. Her gardener, Youmu Konpaku argued with her, but she would not move. “The doujin artist will ruin my lovely body and appetite.” she said. Youmu blew a whistle and waved a chicken drumstick till her arms ached. “I'm not going to spoil my body and appetite for you!” she said rudely. The other Touhou characters came out and argued too, but Yuyuko wouldn't move. Reimu Hakurei told Youmu to get a rope. “We will pull you out.” she said, but Yuyuko blew mist at her and blocked her vision. 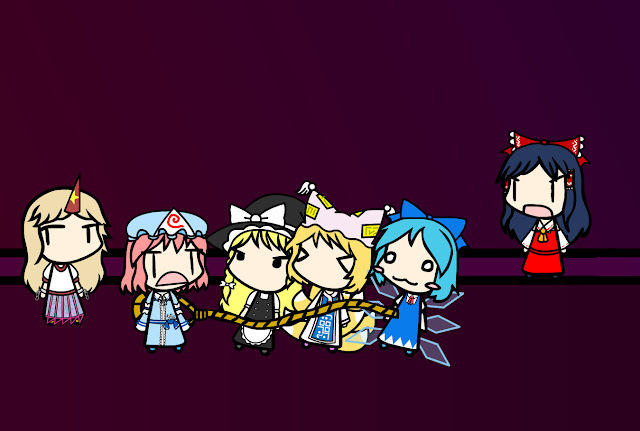 They tied the rope around her waist and all pulled – except for Reimu. “Eirin has forbidden me to pull.” she said. They pulled and pulled and pulled, but still Yuyuko stayed in the tunnel. Then they tried pushing Yuyuko. Reimu said, “One, two, three, push!” but did not help, “Eirin has forbidden me to push” Reimu excused. At last, Yuugi Hoshiguma arrived, and was told to push Yuyuko in exchange for some sake. The oni, Youmu, and Reimu all argued with Yuyuko, “See! The doujin artist stopped making lewd pictures of us!” they said. So Yuugi went behind Yuyuko and she pushed and huffed and huffed and pushed as hard as she ever could, but Yuyuko stayed in the tunnel. So they gave up. “We shall leave you here for always and always and always.” they finally said. She is sad, because no one will ever see her and feed her anything again. But I think she deserved it, don't you? I'm planing a sequel to this called "Cirno, Marisa, and Yuyuko". They pulled and pulled and pulled, but still Yuyuko stayed in the tunnel. Yukari and Marisa would visit the tunnel where Yuyuko had been shut up. Poor Yuyuko had no spell cards to answer with, she was hungry; soot and dirt from the tunnel roof had spoiled her clothes and lovely body. She was cold and unhappy, and wanted to come and be in the games again. Marisa was always a playable character. She was proud of being one of the few magicians strong enough to do it. She was out dealing with an incident with other important people like Reimu Hakurei (and ZUN holding a camera) who had punished Yuyuko. Marisa was seeing how fast she could go, “Hurry, hurry, hurry!” she panted. “Trickety witch! Trickety witch! Trickety witch!” said ZUN. Closer and closer she came – she was almost there, when crack: “ARGGGH ------------ AHHHHH!” she was in a could of danmaku and went slower and slower. “Oh dear,” said Marisa, “We were going so nicely too...Look at Yuyuko laughing at me.” Marisa made a face at Yuyuko and fired a master spark, but missed. While ZUN went to go see who was left, they picked up Marisa and put her on the other side of the path, out of the way. The only character left was Yukari, “I'll come and try.” she said. “Will you help deal with this incident, Yuyuko?” she asked. “Yes!” said Yuyuko at once. So ZUN and Youmu got some food ready; fanboys broke down the brick walls and put down a new path. When she got enough energy, Yuyuko walked out. She was dirty and her mob cap was covered in cobwebs. “Ooh! I'm so stiff. Ooh! I'm so stiff.” she groaned. “You'd better have a run to ease your joints, and find your spell cards.” said Reimu. Yuyuko cam back feeling better and she was put in front. “So am I.” replied Yukari. “Shoot hard; shoot hard; shoot hard.” puffed Yukari. “We'll do it; we'll do it; we'll do it.” responded Yuyuko. “Shoot hard we'll do it; shoot hard we'll do it; shoot hard we'll do it.” they said together. 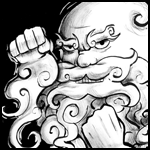 ZUN's camera jerked and began to move, slowly at first, then faster and faster. “We've done it together! We've done it together! We've done it together!” said Yukari and Yuyuko. “You've done it, hooray! You've done it, hooray! You've done it hooray!” sang the fans. All the fans and characters were excited. Reimu leaned over to the side to wave to Yukari and Yuyuko; but they were going so fast that her bow fell off and was blown into a field where a youkai ate it for lunch. They never stopped till they reached the Hakurei Shrine at the end of the plot. The fans all said “Thank You” and ZUN promised Yuyuko a redesign. Yukari and Yuyuko went home quietly and on their way, went and helped Marisa (ZUN and Reimu's orders) back to her place. All three are now best friends. Wasn't Yuyuko pleased with her new design. 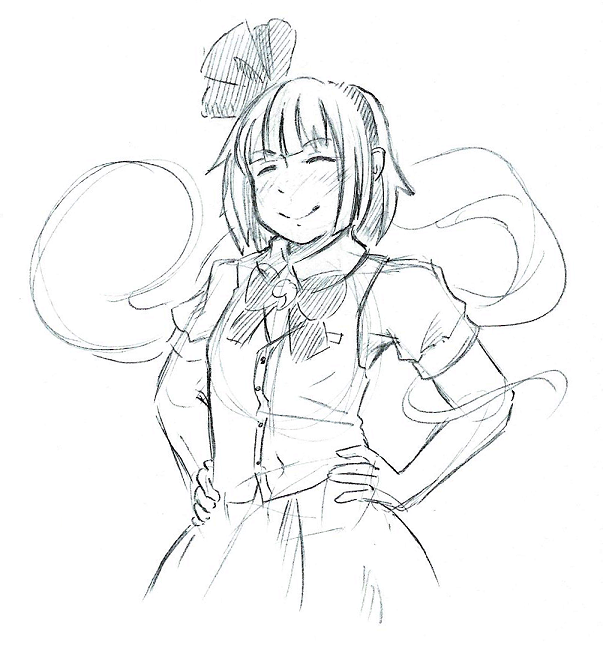 She is very proud of it, as all good Touhou girls are – but she doesn't mind the doujins now, because she knows that best way to keep looking nice is to not run into tunnels, but to ask Youmu for some mind bleach or for Keine to rewrite history so it didn't happen in the first place, when the doujins are over. also yuyuko's design is good enough dude. It made more sense in the original story this fic was based off of. Merged so that the ongoing series can be all in one thread, as per the posting style of the board. What story would that happen to be? The first story was based off of the Railway Series story "The Sad Story of Henry" and the fic after was based off of its second part "Edward, Gordon, and Henry", its just that any railway references have been removed and the characters replaced by Touhou characters. Sorry to bump this topic, but...I've made a reading of this story for my brand new channel! I have also took some liberties with the beginning poem so as to flow better.